Tough sinus and allergy symptoms come during both the cough-cold and allergy seasons. Advil® Allergy & Congestion Relief treats your toughest allergy symptoms—including nasal congestion. Most allergy medicines don’t do that. The ibuprofen in Advil® combined with an antihistamine and a decongestant is especially well suited to relieve upper respiratory symptoms associated with allergies. 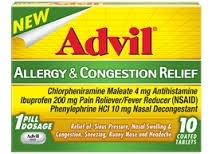 Advil® Allergy & Congestion Relief treats your multi-symptom sinus and allergy needs with just one tablet by combining the power of Advil® and a proven decongestant to reduce swelling due to nasal inflammation, plus an effective antihistamine to relieve sneezing and runny nose, symptoms associated with allergies. Do not take more than directed. Adults and Children 12 Years of Age and Over: Take 1 tablet every 4 hours while symptoms persist; do not take more than 6 tablets in any 24-hour period, unless directed by a doctor. Children Under 12 Years of Age: Do not use because this product contains too much medication for children under this age. Active Ingredient (in Each Tablet): Chlorpheniramine Maleate (4 mg), Ibuprofen (200 mg) (NSAID) (Nonsteroidal Anti-Inflammatory Drug), Phenylephrine HCl (10 mg). Inactive Ingredients: Acesulfame Potassium, Artificial Flavors, Carnauba Wax, Colloidal Silicon Dioxide, Corn Starch, Croscarmellose Sodium, Glycerin, Glyceryl Behenate, Hypromellose, Lactic Acid, Lecithin, Maltodextrin, Medium-Chain Triglycerides, Microcrystalline Cellulose, Pharmaceutical Ink, Polydextrose, Polyvinyl Alcohol, Pregelatinized Starch, Propyl Gallate, Silicon Dioxide, Sucralose, Synthetic Iron Oxide, Talc, Titanium Dioxide, Triacetin, Xanthan Gum.